Bijli Mahadev is a temple dedicated to lord Shiva. At an elevation of 2452 metres, the temple overlooks Parvati valley. This temple is unique because the ‘Shiva-Lingam' in the temple is occasionally struck by lightning and it shatters into pieces. The acting priest then uses butter as an adhesive to put the lingam together. The temple is named after this natural phenomena, where"Bijli" refers to lightning and "Mahadev" is one of the names for lord Shiva. The trek to Bijli Mahadev temple is an easy 3 kilometre climb from Chansari Village. The village lies 24 kilometres east of Kullu (H.P.). The route is well marked and it is part rock and part concrete. The trail begins as a stiff climb but it eases out into a gentle climb after the first kilometre. There are three compelling reasons for a winter trek to Bijli Mahadev temple. The first reason has to do with the spellbinding view from the temple. The temple is situated on a ridge that overlooks the Parvati valley. On a crisp winter morning the sun lights up Parvati Valley in shades of blue. The valley is especially enchanting because the Parvati river carves a meandering path through these imposing mountains. Parvati valley bisected by Parvati river. Bhuntar (Kullu) airport is clearly visible in the foreground. Discovering the temple's heritage is the second reason for making this trek. The temple's inner sanctum is carved in wood. These beautiful and lifelike carvings depict natural and mythological scenes. 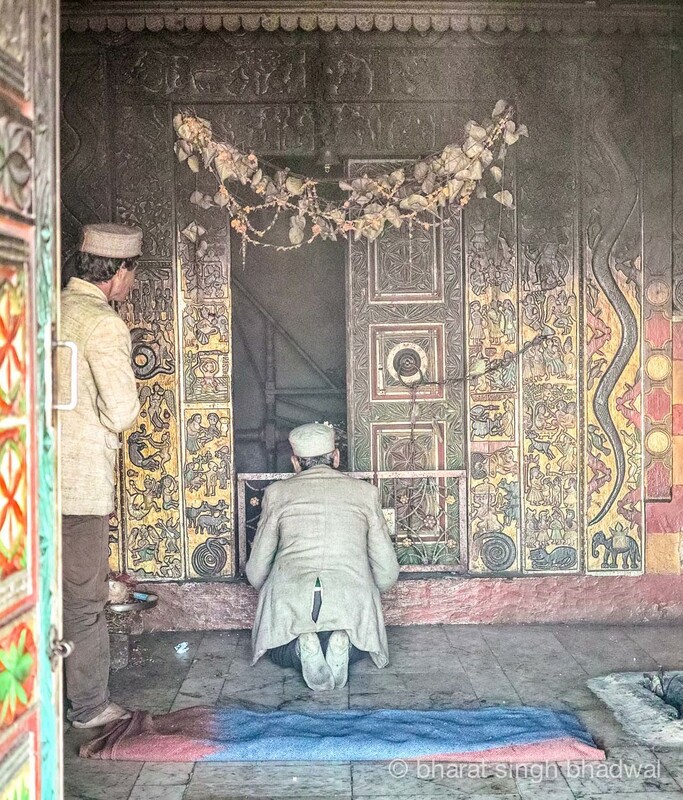 Especially worth viewing are the temple doors that hand painted in natural and muted colours. These colours add drama and charisma to the wood carvings. The stone sculptures outside the temple, rival the wood carvings of the inner sanctum. The “Nandi” bull is especially lifelike and worth a closer look. Winters are off-peak season at Bijli Mahadev. Only a few locals make it up the hill and the shops were closed. This is the perfect time to discover the various facets of the temple in tranquility. The final reason for our visit to Bijli Mahadev temple has to do with the state of trekking trail. Multitudes of pilgrims and tourists have turned this once beautiful trail into a garbage dump. The route from Chansari, all the way to temple grounds is littered with non biodegradable wrappers and bottles. So much so, we ran out of garbage bags on our trail cleaning effort and had to resort to borrowing a few cardboard boxes to pick up the litter. However, even this effort felt inconsequential against the years of garbage along the trail. Thus, we urge all our readers visiting this temple to help keep this trail clean. Another legend associated with this shrine states that Vashistha, one of the Saptrishis, prayed at this site to Lord Shiva and requested him to absorb the energy of lightning to save the world. The lord answered his prayer and this took place at the confluence of the Beas River and Parvati River. To mark this incident a temple was constructed here and named Bijli Mahadev. The trek to Bijli Mahadev starts from Chansari village. Chansari village lies 24 kilometres east from Kullu (H.P.) and is accessible by public bus and taxi. The metalled road ends at this village. The walking route starts as a narrow walking trail meandering through the village. The trail then turns into a concrete path just as the village ends. 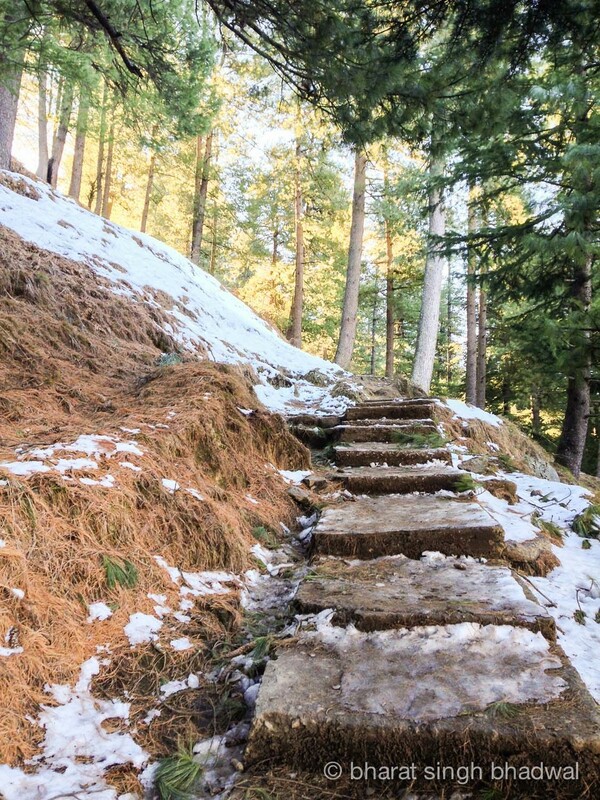 This concrete path winds uphill through a kilometre of Deodar and Firs. Concrete steps covered with snow and ice. Be careful when descending! The initial climb is stiff, but the trail eases into a gentle climb after the first kilometre. During winters, the wooded section may be slippery with black ice, thus descend carefully. A small shrine in the woods marks the halfway point of this trek (see GPS waypoints). The trail emerges from the woods at the ridge line below the temple. A few shacks (closed in winters) dot the ridge next to a pond (frozen in winters) at this point. The temple is at the top of this ridge, a short climb from the frozen pond. Panorama view from the temple. Kullu town has hotels ranging from budget to luxury. Some houses in Chansari offer budget home stays in summer. In winters the home stay options are less but still available. There are a lot of shops at Bijli Mahadev, however all of them are closed during winters. Camping is possible and recommended at a meadow near the temple. Pleasant during the day. Nights are very cold, windy and prone to thunderstorms. route overview with elevation - Chansari to Bijli Mahadev. View in wikiloc / Google Maps. Caution - The ridge along the temple is prone to lightning. Therefore during thunderstorms, stay below the tree-line, avoid high ground, and keep away from solitary tall trees.